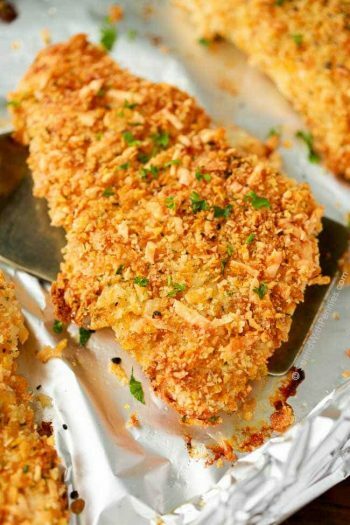 Baked Chicken Breasts is couldn’t be more simple or delicious to make! 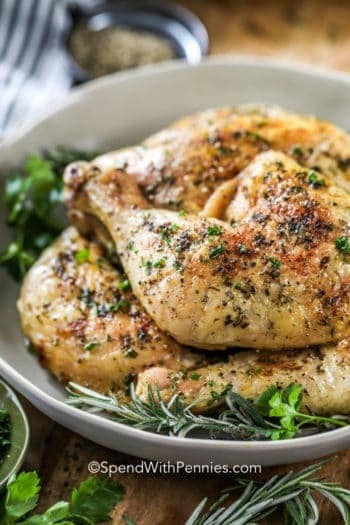 Chicken breasts are tossed in a simple herb mixture then oven baked until they are tender and juicy! 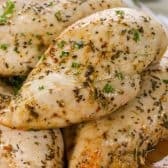 This easy baked chicken recipe makes chicken breasts that are lightly seasoning and great to top Chicken Salads, add to sandwiches, or stir into Easy Biscuit Chicken Pot Pie. While these are great to use in any recipe that requires cooked chicken breast, they’re so juicy and delicious, they’re great perfect served on their own too. This is one of those recipes that you’ll find yourself using again and again. 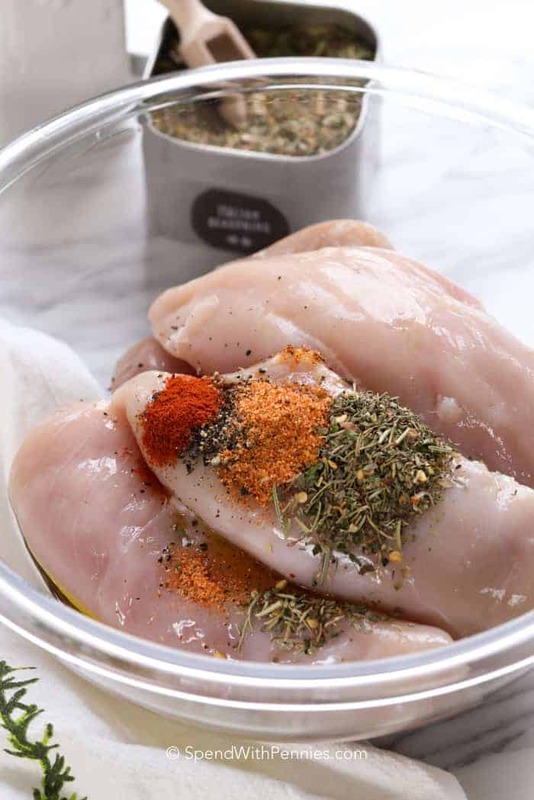 It produces an all purpose chicken breast that can be added to recipes, served in a sandwich or prepared ahead of time for meal prep. Of course we also love to serve it right of the pan as is with a side of Baked Zucchini and a salad. Baked chicken breasts are naturally lean, packed full of protein, and easy to make. 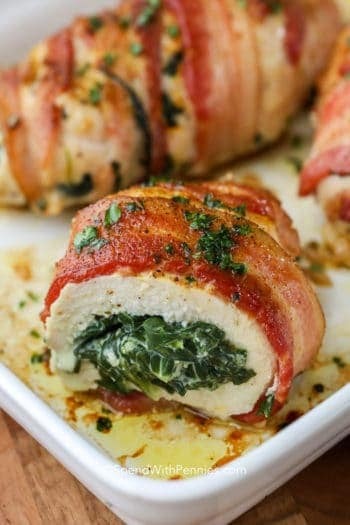 They are as simple as adding some herbs and oil, and throwing them in the oven! The key to a perfect baked chicken breast is timing. 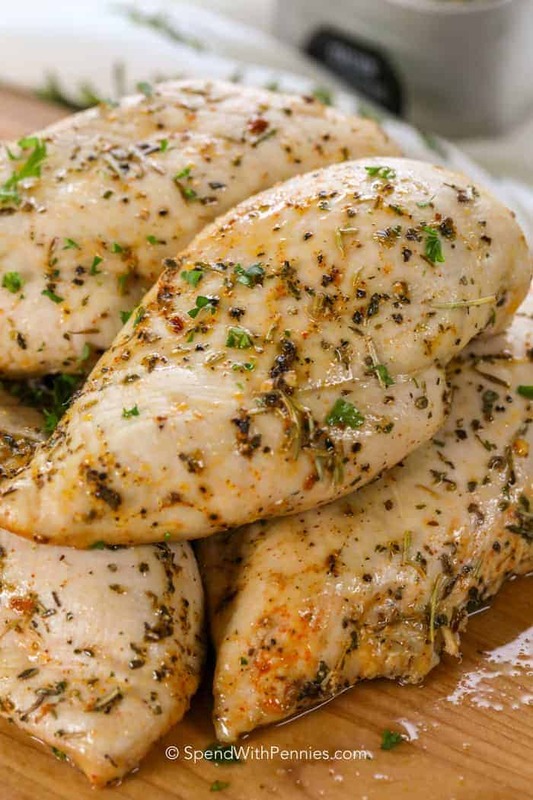 Chicken breasts are naturally lean, so if you overcook them they will come out dry. 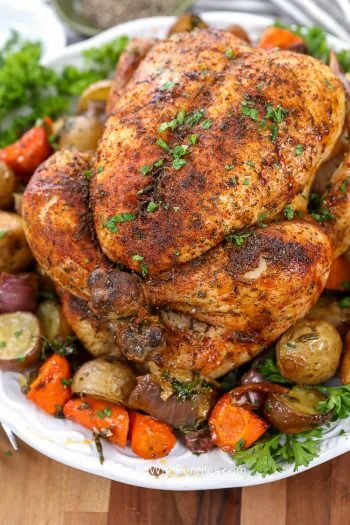 You want to hit the cooking time perfectly, and make sure you rest your meat before cutting it to allows all of the juices to reabsorb into the chicken keeping your chicken breast extra moist! 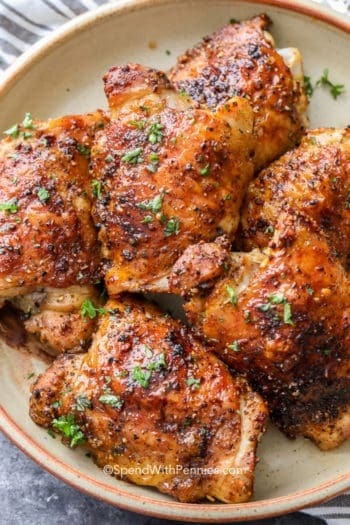 Cooking chicken breast at a higher temperature makes the best chicken as it seals the juices in while it cooks (I cook chicken at 400 degrees F). The chicken breast should reach an internal temperature of 165 degrees F (I remove it around 160-162°F and let it climb to 165 while resting on the pan). This will take between 22 and 26 minutes depending on the size of the chicken breasts. Make sure you use a quick read meat thermometer to get them perfectly cooked. If you have other items in the oven at a lower temperature, you can cook chicken breasts at 350 degrees for a bit longer although I prefer the higher heat above. 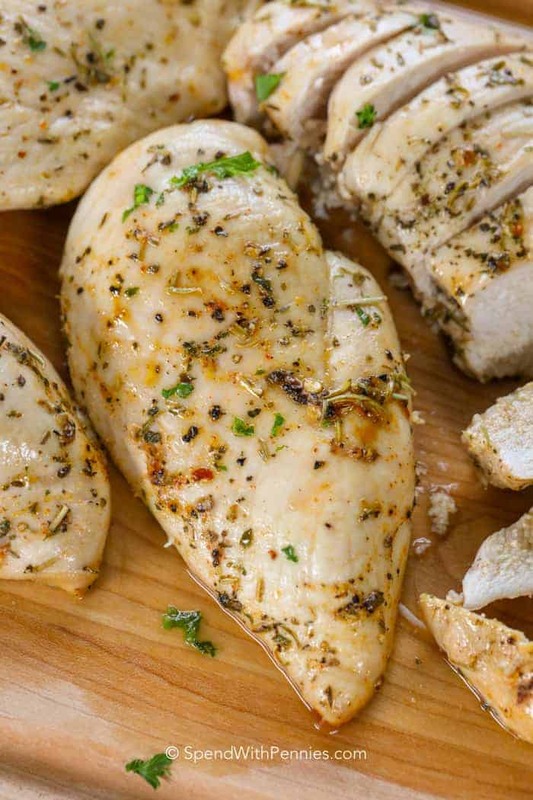 If the chicken breasts vary in thickness, using a meat tenderizer to pound them to an even thickness is a great way to ensure that they all cook evenly! Making baked boneless chicken breasts is very simple, the key is in the cooking time and temperature. Lightly grease a baking dish or pan so the chicken breasts don’t stick. Bake chicken breasts for 22-26 minutes or until they reach 165°F. Rest them before you slice or pull them. 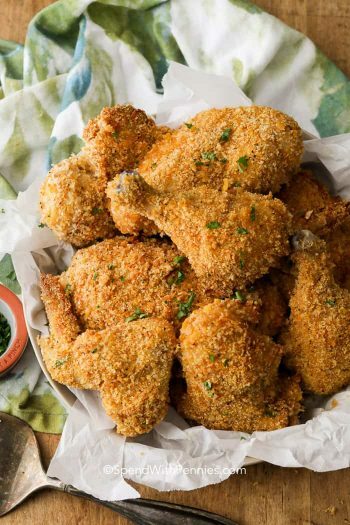 This easy baked chicken breast recipe has a simple mixture of Italian seasoning, paprika, seasoning salt and pepper, but you can change it up depending on the recipe you are using the chicken in and what you have on hand. Rosemary, oregano, and even lemon juice all make great additions to this recipe. Homemade Cajun seasoning is also a great addition if you’re making something like cajun chicken pasta! How to Boil Chicken – Makes broth + meat! How to Make Poached Chicken – 15 minutes! Easy Grilled Chicken Breast – SO juicy! Baked chicken breasts are a simple and healthy dinner option that is packed full of protein! 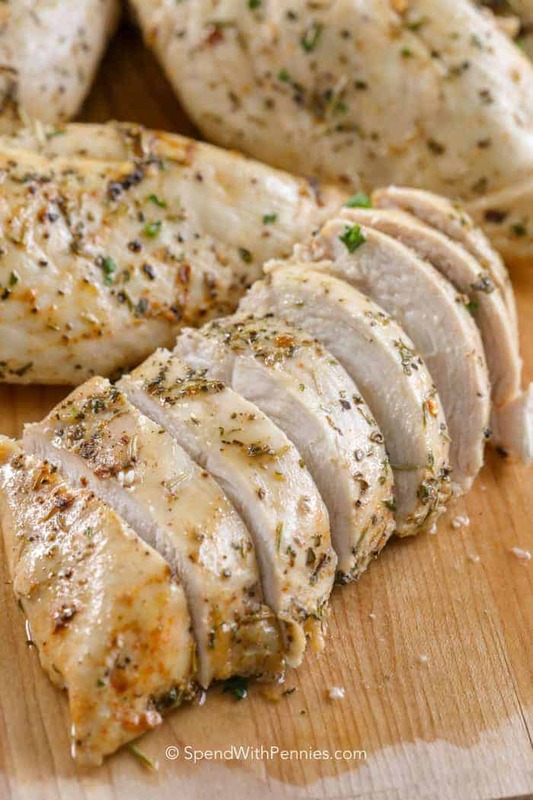 Toss chicken breasts with olive oil and seasonings. Mix well to coat. Place on a lightly greased pan and bake 22-26 minutes or until temperature reaches 165°F. Rest 5 minutes before slicing. Smaller chicken breasts will take closer to 22 minutes, larger chicken breasts will take closer to 26 minutes. For best results, use an instant read thermometer. Did the 400F thing for 22 mins, checked with therm, were about 180F inside, pulled them out, put some bbq sauce on them, and a dash of cayenne, and put them back in on 350F for about 5 mins, and they were delicious and juicy. My mouth is watering right now…LoL thanks for the yummy chicken. So glad you loved them… your flavors sound delish!! I have used this recipe twice. Great results every time! As I am writing this there is chicken in the oven right now.I am recently widowed so cooking was done by my wife (good cooking). I happen upon this recipe one day and decided to give it a rookie try! I think that if I can bake good juicy chicken anybody can! Using this recipe you can not go wrong!Thank You !!! I’m so glad you’ve loved this chicken as much as we do Steven! Happy Cooking! This will be my SECOND time baking this for me and my wife. We both love it! Thank you for posting! I am so glad your family has enjoyed this recipe GEaston! I used my homemade Mediterranean spice mix and the chicken turned out amazing! Nice a juicy and lots of flavour. It was perfect! Thank you for your help Holly. I am so glad you enjoyed the recipe Brenda! I just tonight followed your instructions for cooking chicken and for once my baked chicken breast came out juicy!! Thank you for posting your recipe!! I’m so glad you enjoyed them Alex! Glad you loved it Lacoshia! My 5 & 8 year olds loved it! (As did I.) The chicken was juicy and flavorful, and it couldn’t have been easier to make. Great weeknight dinner option, particularly when you’re short on time! Glad your family loved it Debora! Very good and so simple to make!! I used my own seasoning mix of tarragon, parsley and basil. Saving this recipe! Your seasonings sound delish! So glad you loved it as much as we do! Could i let the chicken marinate in the oil mixture for a few hours before hand? That should work just fine Jess. Enjoy! I made this using 2 different spices/herbs mixes. Onebatch I did Teryiaki & one I used Kraft Robusto Italian dressing on. Both turned out delicious. I use fresh Amish chicken breasts with no GMO’s. It took about 12 minutes each side for breasts. Simple, & it works. Thank you! I am so glad you loved them, those sound like delicious additions! I’ve made this recipe twice now and both times turned out amazing! I added fresh minced garlic and some other seasonings as well. The chicken was very flavorful and juicy! I am so glad you like them Kailee! Those sound like great additions! Tried this today for use in a casserole and it worked great. Tweaked the seasoning to complement the curry flavor in the casserole recipe. The only thing I did differently was to flip the chicken halfway through. They were large breasts and took and extra 5 minutes. Meat thermometer is my new best friend. Thanks for the recipe! So glad they worked out well for you Carol! I don’t have seasoning salt. Could I just use salt instead? Last minute recipe. I am sure salt will work just as well, but I normally use seasoning salt for this recipe. 24-26 minutes is not long enough. I cooked everything to line up just right but I took the chicken out and they were quite pink :( I had to put them back in the oven. Time can vary based on the size of your chicken breasts (and other factors such as if they’re chilled from the fridge going into the oven). I would always suggest using a thermometer to ensure the chicken reaches 165°F. I have thin pre-sliced chicken breast, should I prepare the same and just cook for a shorter time? The preparation should be the same but yes, cook it for a shorter time (you want them to reach 165°F. Enjoy! I made this tonight. It was so yummy!! Wonderful recipe. do you cover the chicken? I wonder if it’ll dry without a cover. No need to cover the chicken Roxie. Enjoy! What happens if I do cover the chicken ? I have only made this recipe as written so can’t say for sure. So glad that your first home cooked meal was a big success Tim! Makes my day! I tried this recipe abd i loved it !! You’re welcome. I’m so glad you loved it! How long would you cook the chicken breasts from frozen? Still at 400 degrees F? I would still do 400°F but would cook them about 30-40 minutes depending on size. I’d suggest checking them with a thermometer to ensure they reach the right temp but don’t over cook.